If you’ve been following me for awhile you know that my hair magician here in New York is Sarah Rappolt and beyond giving me the perfect haircut every time – she also indulges me from time to time in some of her killer hair styling (see what we did last Fall here). This time around we wanted to update the basic ‘hair scarf in ponytail’ look that everyone (including myself) sported all Summer. I’m absolutely thrilled with the results – all taking no more than 5 minutes each and honestly, easy enough that even an amateur like myself can do it. 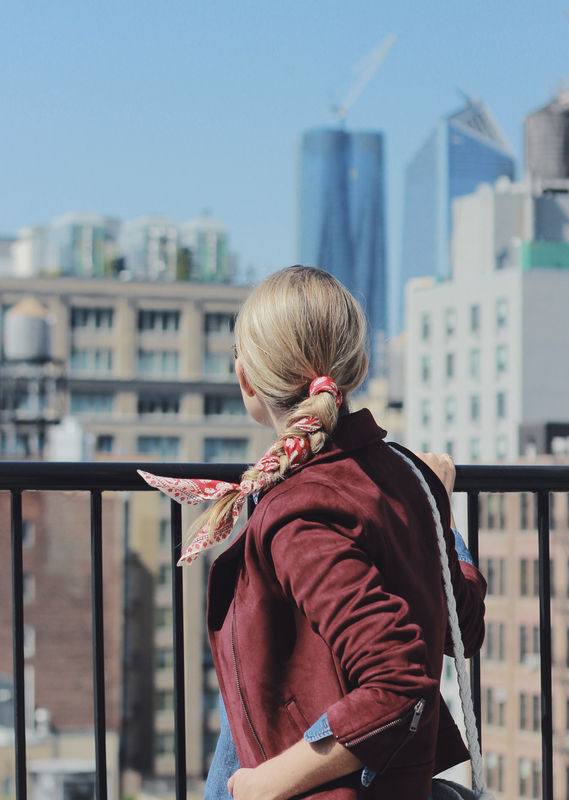 Below – 3 new ways to wear a hair scarf this Fall. Hope you try! “THAT 70’S BRAID” – Start with a low ponytail, being careful to leave some volume at the sides and crown of your head. Fold/roll your scarf diagonally to form a long, thin rectangle shape. Tie around your ponytail securing underneath in a single knot. 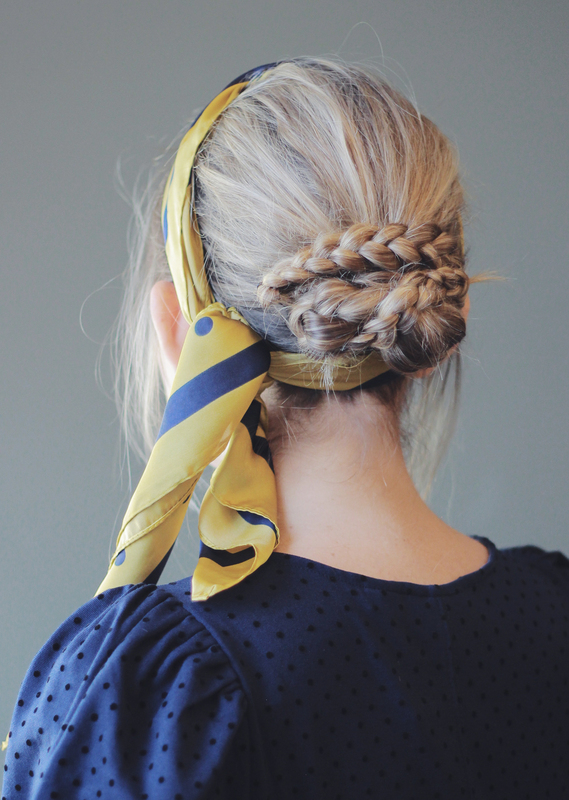 Then divide your hair into three sections and add the ends of the scarf into two sections. 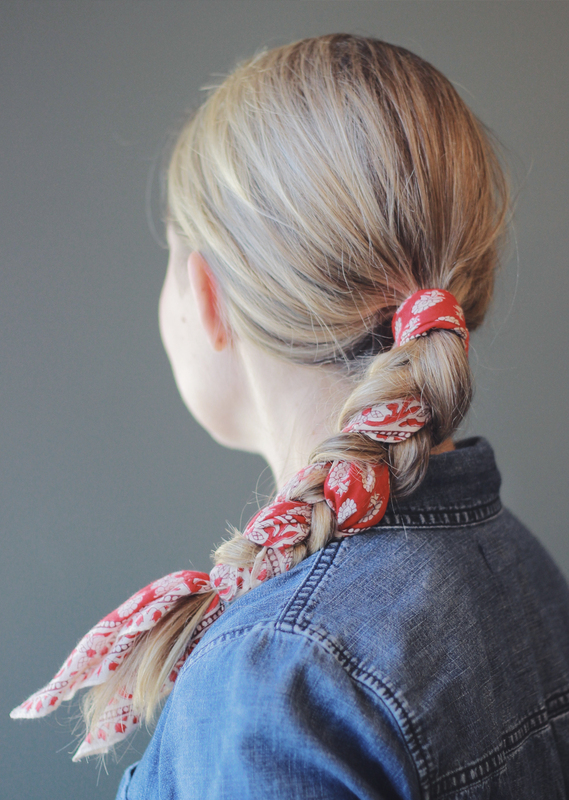 Braid the strands and secure at bottom with a clear elastic, leaving several inches of hair and the scarf ends out. “THE BRUNCH BUN” – Sarah and I kept calling this the new ‘messy bun’ because it feels just as simple but somehow way more chic. Perfect for a low-key weekend brunch with friends. Start with textured hair (Sarah used this spray and added a few waves with a 1″ curling wand) and secure in a mid-height ponytail. Fold/roll the scarf horizontally into a long, rectangle shape and secure the end around your ponytail – leave one small ‘tail’ and one very long side. 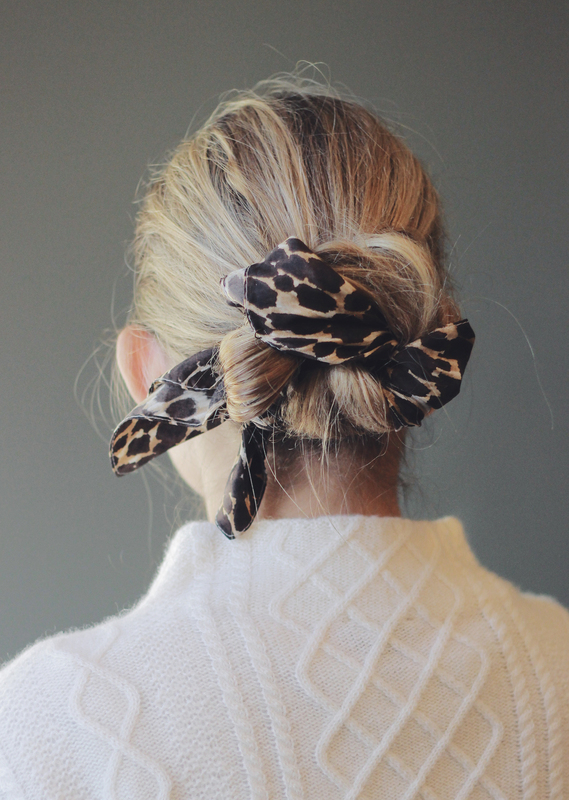 Using the long side, twist your ponytail and the scarf together then loop around into a bun shape. Pin in place and adjust the scarf, pinning where needed to further secure. Leave both small scarf ends out at the bottom as a finishing touch. “RIVIERA ROMANCE” – this simple updo feels very ‘I’m going to a moonlit dinner on the Italian coast’ to me. Although I like to think it will work just as well for a date night here in New York. Start with a low ponytail, divide in half and braid each section tightly. Then wrap the braids into a bun and pin in place. Fold the scarf diagonally to form a long, skinny shape and wrap around the crown of your head, tying firmly in place at the nape of your neck. Pin in place if it feels like it might slip.